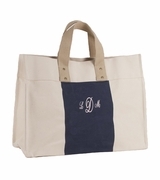 Striped anchor canvas boat totes measure 20"W x 15"H x 5" across bottom. Zipper closure. Exactly as I was expecting. Perfect!